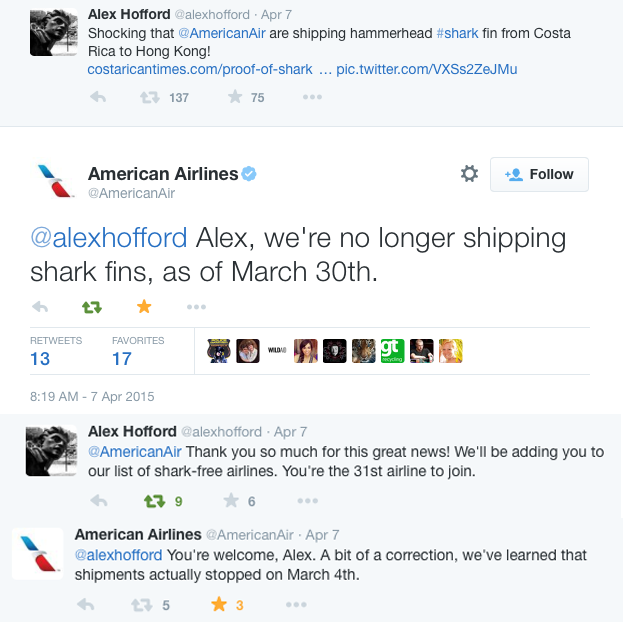 On Tuesday, American Airlines announced via Twitter that it no longer accepts commercial shipments of shark fin for transport — this after wildlife groups discovered the airline had shipped shark fins from Costa Rica to Asia in December. An investigation by conservation groups Turtle Island Restoration Network and PRETOMA found that hammerhead sharks had been flown from Costa Rica to Hong Kong via stopovers in the U.S. In a statement, Turtle Island said they presented American with evidence of the fin transport and worked with the carrier on the policy shift. "We are deeply gratified to see our partner American Airlines acknowledge its ban on shark fin shipments," Doug Karpa, legal program director of Turtle Island Restoration Network, said in a statement. "American Airlines deserves full credit for taking proactive measures immediately when we came forward with evidence of this trade." American has yet to issue a formal statement on the matter, however, as other major carriers including Thai Airways and Etihad Airways have when they announced policy changes on shark fin shipments. Airlines that had already banned shark fin shipments include Emirates, Asiana Airlines, Korean Airlines, Qantas and Air New Zealand.